Salt! The only thought that comes to our mind, is avoid /reduce it's intake. Have you ever wondered what the function of salt is? Salt (common salt or rock salt) is basically made up of sodium and chloride. Sodium is a very important component of our blood and body fluids, and help in the conduction of nerve impulses necessary for normal muscle functioning. They are also necessary to maintain normal blood pressure. Sodium is not only present in salt, but is also present in all foods in different quantities. 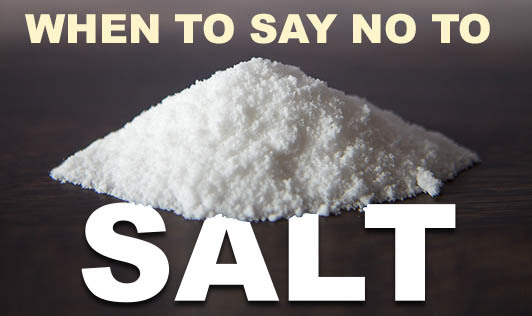 An excess of sodium intake can lead to fluid retention and a temporary rise in blood pressure. Diets very rarely lack sodium. However, a low sodium level can lead to muscle cramping and an imbalance of fluids in the body. So, what is the role of sodium in pregnancy? Most pregnant women have been advised to restrict their sodium intake, as it could increase their chances of developing high blood pressure, bloating and swelling. But recent research says that salt need not be completely eliminated from your diet. A certain amount of salt is necessary during pregnancy to maintain the right fluid balance. However, it is essential to only cut down the "extra" or "excessive" salt that could be coming from junk foods, fast foods, deep fried foods, preserved foods, canned foods, and some foods served at restaurants. This is the "extra" salt that could increase risks during pregnancy. 1. Buy fresh food whenever you can. 2. If you eat non-vegetarian food, try to stick to fresh sources instead of canned and preserved alternatives. 3. You could add some herbs and spices in moderate amounts to enhance flavour instead of adding too much salt. 4. Cook rice, pasta, noodles, etc without salt. 5. If you are eating out, pay attention to the type of food and the possible amount of salt in them. 6. Avoid all canned and preserved foods. 7. Read food labels well before buying them off the shelf. A moderate intake of salt "to taste" your food is normal and safe, unless you have been specifically advised to eat a low-salt diet due to certain other complications. Consult with your doctor or dietitian to know your salt intake!